Fulton, NY – Participants in CYO Summer Recreation Program were introduced to some of the residents of the Rosamond Gifford Zoo when Zoo Educator, Alicia Arcaro brought the Zoo To You program to Fulton. Zoo educator Alicia Arcaro of Rosamond Gifford Zoo recently visited the CYO Summer Drop-In Recreation program. 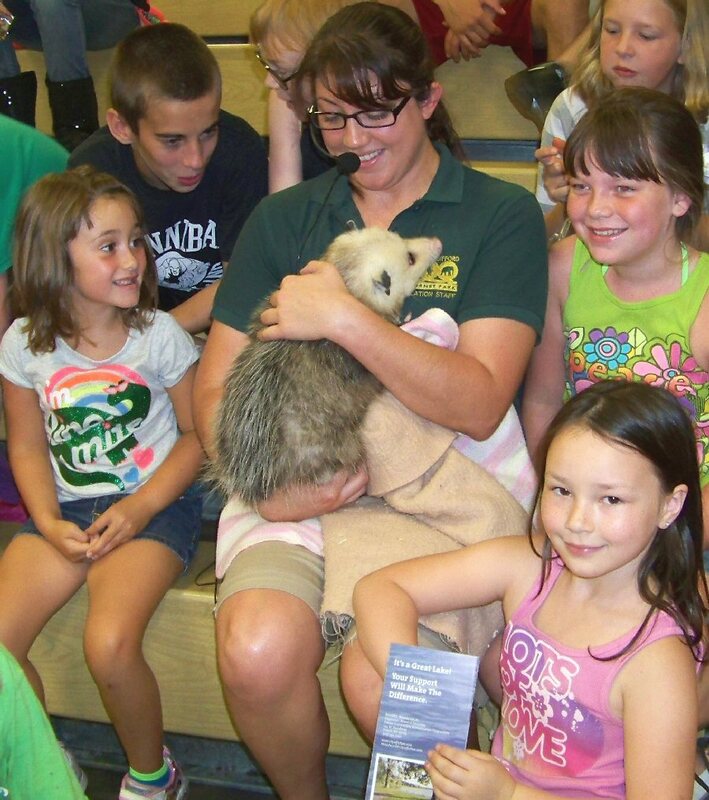 As part of the Zoo to You program Arcaro delighted CYO youth with several animals including this Virginia Opossum. Clockwise from left are: Hailey Lischak, John Roggio, Christina Derouchie, Samantha Humphrey, Justine Stassi-Martin. Arcaro provided CYO participants with an informative presentation that gave them a close-up look at some of the zoo’s many animals. While the Virginia Opossum and the African Pygmy Hedgehog were interesting and cute, it was the African Ball Python that brought out the most interesting reactions, from wide-eyed excitement to cautious delight. A traveling, inquiry-based educational program, the Zoo to You program makes approximately 300 visits each year to schools, libraries, community centers, senior centers/facilities, day care centers, scout groups, etc., and serves as a bridge between the Rosamond Gifford Zoo and the community. Arcaro added that the zoo recently welcomed two new babies, Markor twins; a male and a female named Sasha and Turgan. Their parents are Edith and Sunny. Located at Burnett Park in Syracuse, the Rosamond Gifford Zoo is open 10 a.m. – 4:30 p.m., year round except for Thanksgiving, Christmas and New Year’s Day when they are closed. The CYO Summer Drop-in Recreation program is funded in part by the United Way of Greater Oswego County, the NYS Office of Children and Families, and the City-County Youth Bureau of Oswego County. For more information on the program contact CYO Coordinator, George Timmins at 315-598-3980 ext 254. Primary funding sources for Catholic Charities of Oswego County programs are the United Way of Greater Oswego County, the Diocesan Hope Appeal, the County of Oswego, and private donations by individuals, local companies, and organizations.